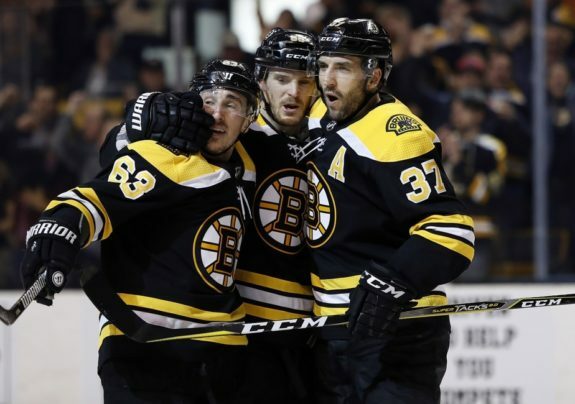 Patrice Bergeron earned a hat trick in the Boston Bruins’ home opener against the Ottawa Senators on Monday, making him the difference-maker as the Bruins won 6-3. The beauty of Bergeron’s three-goal afternoon was in the execution. Each goal was distinctly different and required unique skills. One goal was the result of hard work in the crease, another was thanks to a well-placed wrister, and the last was due to reading the play and deciding that the best option was to toss the puck on net. The Bruins’ alternate captain potted his first goal of the game 30 seconds in, sparking a fire within the hometown faithful, which is often lacking during a matinee game. Charlie McAvoy began the sequence with a skillful play, pinching along the boards and sending the puck below the goal line with his backhand. David Pastrnak scooped it up in the corner and, seeing that he had ample space, skated to the near post and tried to stuff in a goal. Recognizing that his winger was headed for the net, Bergeron followed close behind. Pastrnak’s opportunity created chaos in front of the Senators’ goal, and that’s when the centerman capitalized. He took one whack at the puck which seemed to hit goaltender Mike Condon’s pad. Then, as he fell down with the Senators defense trying to clear him from the crease, the 33-year-old found the puck between Condon’s legs and sent it to the back of the net, a great play that required muscle and offensive awareness. If he hadn’t followed Pastrnak to the net, he wouldn’t have been there to clean up the rebound. It wasn’t the most beautiful goal of his career, but it was Bergeron’s second of the young season and his first of what became a career-night for the veteran. Bergeron’s second goal of the day came with the man advantage. Bergeron needed a skilled shot, quick decision-making to get open for a pass, and a helping hand from Brad Marchand. The sequence began with a shot from the point which deflected off of a Senators defenseman in front and went wide. Bergeron recognized that Marchand was patrolling the corner and would be able to gain possession. He then left the slot to open himself up for a pass in the face-off circle. With a crafty backhand, Marchand got the puck to his centerman who sent the one-timer wrist shot to the top-left corner of the cage. The Senators’ penalty killers had basically forgotten about Bergeron. The two forwards on the penalty-killing unit were at the point as the puck was played by Boston’s defensemen, one was covering the original puck carrier while the other was prepared to take away the potential point-to-point pass. Both of the Senators’ defensemen were also busy; the one closest to the puck left the net to cover Marchand while the other decided to tie up Ryan Donato who was looking for a pass out front. Bergeron simply glided to the open ice. With Condon conveniently screened by Donato in front, Bergeron was able to put his second goal on the scoreboard, whistling it by the netminder’s ear. 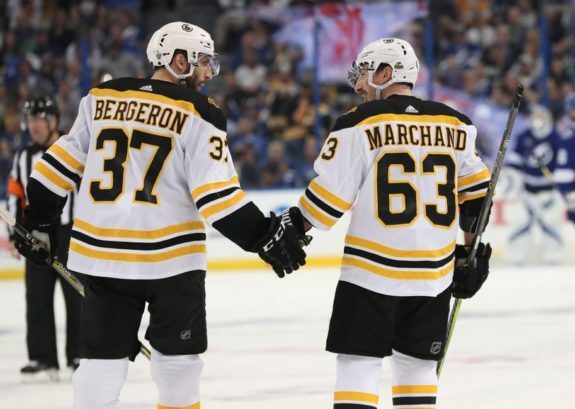 Marchand didn’t seem to know where his alternate captain was but had played with him long enough to know where he’d be. That’s why the Bruins’ first line is too good to break up. The final stage of Bergeron’s hat trick required some luck. However, it was also a product of reading the ice and making a smart play. When you combine the two, you’re bound to see a positive result and Bergeron now leads all Bruins in goals scored. Marchand again assisted, this time by tapping the puck to the Bergeron as the Bruins broke into the Senators’ zone. Marchand and Pastrnak both rushed to the crease, creating some traffic and looking for either a pass or a deflection to give Boston a two-goal lead in the third period. Bergeron went down to the left face-off circle and had a big decision to make. He had three options: drop the puck to the point; attempt to feed one of his wingers out front; or toss the puck towards the net and see what happens. Bergeron chose the last option and the back-hand shot bounced off of Senators defenseman, Cody Ceci, and found its way past Condon. TD Garden erupted and hats were tossed onto the ice to celebrate Bergeron’s hat trick. While this final goal involved a dose of good luck it was also a great heads-up play. We know, if you put the puck on net, good things will happen. Bergeron read that both of his wingers were headed for the slot and that a rebound could find one of their sticks. However, thanks to a lucky bounce off of Ceci, the puck found the back of the net instead. Bergeron’s hat-trick game handed him a stat line of four goals and two assists through three games. Marchand now leads the Bruins in points with seven assists while Pastrnak has three goals and two assists. Their line is one of the best active lines in the NHL. It was the fourth hat trick of Bergeron’s storied career. Is he capable of another one this season? How many other Bruins will cause a precipitation of hats before the 2018-19 season comes to a close? 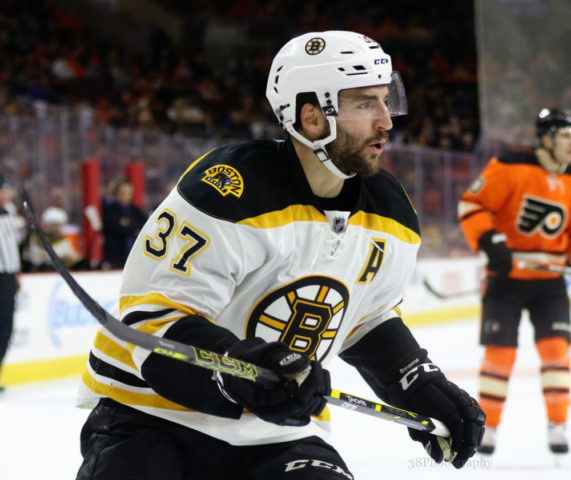 The boys in black and gold have 79 games to see if someone can repeat Bergeron’s feat. You can bet each and every one of those players is itching to build on Monday’s performance when the Bruins take on the Edmonton Oilers on Thursday.